This lovely, two-bedroom, two-bath, vacation rental home-away-from-home, located at 811 Vanitie Ct in Mission Beach, is steps to our beautiful Mission Bay and a few more steps to the Pacific Ocean. It comprises the entire floor of our brand-new custom building on a charming court in North Mission Beach, San Diego, California, offering a private fenced yard with pieceful fountain, and a private, bay view,dining area with gas barbecue. AND, it is within a five- to ten-minute walk to a wide variety of restaurants and shops, and a short drive to Sea World and other local attractions. It is a perfect getaway! You are comfortable in our hideaway regardless of the season. It is light and airy, with ceiling fans in each room for warmer days, and a fireplace and central thermostat heating during the cooler days. Granite counters & vanities. Purified water from every tap & to icemaker in fridge. * Separate full bath with tub/shower. * Fully-equipped kitchen for casual or gourmet cooking. Gas oven/stove, toaster oven, crock pot, blender, etc. Granite counters and an island with bar stools adjacent to indoor eating area. * Separate inside eating area seating four comfortably, also with fireplace view. * Cable Flatscreen HDTV/VCR/DVD/stereo in living room. Comfortable Leather Loveseat and Recliner Lounge near fireplace. * Copy services available if needed. * WiFi High Speed Internet Access. * Beach 'toys' including bicycles, chairs, etc., and a library of videos, books, puzzles, and games. * Tandem Kayak with life vests available on request. * Paddlewheeler - Nightly Entertainment on Mission Bay. * A maximum of five individuals is allowed. * Check-in time is 3:30 PM and Check-out time is 10:30 AM. * No smoking is allowed inside the rental. * A deposit of 25% of total reserved time, based on above rates, is required at time of reservation. * A $75 Cleaning Fee is required, and, instead of a damage deposit, we request guest obtain $1500 damage insurance from Homeaway for a one-time, $59 fee. * Balance of payment is due 30 days prior to scheduled check-in date. * Upon receipt of payment, we will send an instruction sheet with directions, answers to FAQ, etc. Our Mission Bay Hideaway, in North Mission Bay, affords the vacationer all the best of the San Diego Beach and Bay atmosphere. Virtually everything is within a very short walking distance: the beach and bay with every conceivable water sport, marinas, bicycle paths, children’s playground, dozens of excellent restaurants and night clubs, lots of shops, a modern supermarket, internet café, local library, Post Office, Metro Bus Stop, and an amusement park and combination gym, indoor pool and wavehouse recreation facility. Most nights of the year, you can watch the evening fireworks from Sea World, a few miles away. Most other attractions in and around San Diego are just a short drive away. We take great pains to ensure our Hideaway is one of the cleanest and best maintained properties in the area. Saltillo tile floors and throw rugs help to keep the beach and bay sand from gaining a foothold and the central vacuum makes cleanup easy. Purified water from a whole-house system eliminates the need to procure bottled water or ice. Our Fenced In Front Yard is unique to this neighborhood, with very high trees and flowered vines, providing significant privacy for the dining area. The side parking area provides room for storage of bikes, jetskis, rafts, boogie boards, etc. and can also be used for parking a small vehicle in tandem. A stone's throw to the Pacific Ocean on the West and Mission Bay on the East. Cross Mission Blvd at the San Rafael crosswalk, one court to the north, and the Pacific Ocean is 100 feet in front of you. Portable AC added in Living Room for Summer Months. Cools entire apartment. Smoking allowed in outside dining area only. Purified Water @ every tap, Trash Compactor, Beach Toys, Toddler items upon request, No Smoking inside unit. Mission Bay Hideaway shouldn't remain hidden! the ocean (Mission Beach). The apartment itself is completely self sufficient with 2 bedrooms, comfortable queen bed in one and twins in the other room, 2 nice sized bathrooms with good showers and a tub, and a fully stocked kitchen. The living area has a large smart tv and a gas fireplace to take the chill out of early mornings when the weather isn't perfect. The place was spotlessly clean when we arrived, with nice towels and sheets all in place and spares available as needed. All the "toys" anyone needs for a fun stay are also available: 4 bikes, good beach chairs, boogey boards, even a double kayak and rolling cooker. And very importantly, there's a parking spot specifically for this rental, which is unusual and so necessary! Bill and Cathy are friendly, very helpful hosts who took care of any issues immediately (just things like batteries for the remote) and were always available via text to answer questions about dining options etc. ; they even made arrangements for us to have a special tour of the Midway aircraft carrier (docked permanently in San Diego) when they heard that had been my husband's ship 40 years ago. We could not have asked for a better place to escape our midwest winter. We recommend it most highly and hope we'll be able to visit again next year! This property was exactly as advertised. The beds were comfortable, it was clean, nicely furnished and perfect for a small family. We stayed here for a full week as we were in town for a family wedding and did not want to stay at the hotel where the wedding festivities were being held. Maybe the one small issue would be that the signage numbers for the address could be easily missed if one is not carefully looking. But this alone should not discourage anyone from renting this property. Great location. All the space we needed. Comfortable beds. Quiet house. Super nice home owner. Perfect family vaca location. 5min to Sea World, 15min to downtown, airport, and Balboa Park (zoo, museums), 50ft to bay, 1 block to beach. Loved having sea kayak, boogie boards and bikes, etc available to use. Huge plus vs. rentals. We cooked most meals, but great restaurants w/in walking distance. Place was cute and baths, linens, etc. very clean. To be very picky, the place could use some better pots and pans and a maybe good cleaning on things like ceiling fans, but these were very minor things. We thought this place was a great value and a great jumping off point for our vacation. The owner was very nice accommodating. Would stay here again. Located between the bay and the Pacific Ocean, this cute, roomy apartment on a quiet block was perfect for us. The amenities (kayak, grill, plenty of clean linens, kitchenware, etc.) were really helpful. We felt right at home! We loved staying at Mission Bay Hideaway! It was a perfect location, a few minute walk to the bay or the beach, close to coffee shops and cafes, but no noise from traffic or airport. It was amazing. Bill was super friendly and easy to work with both in booking and while we were staying at the MBH. We would highly recommend staying here - we traveled with an infant and a toddler, and found it to be a great setup for us! Steps to the Pacific Ocean on the West and Mission Bay on the East. Short Walk to numerous restaurants and attractions including Childrens' Playground, Amusement Park, Paddlewheeler with Nightly Entertainment on Mission Bay. 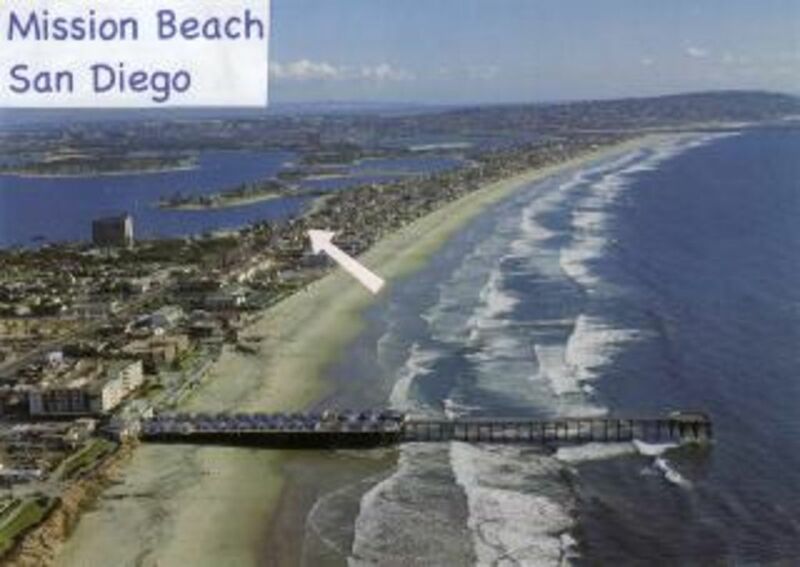 Short drive to San Diego Municipal Golf Course & Sea World to South and Pacific Beach & La Jolla to the North. Credit Card Payment 2.5% fee (3.75% non-U.S.) Pets less than 50lbs considered, with fee.